As special guests of the collateral event “Salon Suisse”, organised by the Swiss Arts Council Pro Helvetia (www.biennials.ch), “New Schools of Thought” is an intensive, informal event challenging the frontiers of architectural education and mediation. Through a series of one-to-one conversations with experts, new tendencies emerging from the first findings of the international research project NEST conducted at the University of Liechtenstein (www.uni.li/nest) are being discussed. Confirmed speakers include Odile Decq, architect and Dean of Confluence Institute for Innovation and Creative Strategies in Architecture in Lyon, Martino Stierli, the Philip Johnson Chief Curator of Architecture and Design at The Museum of Modern Art in New York, Harriet Harriss, Senior Lecturer at the Royal College of Art in London and Lukas Feireiss, curator and writer from Berlin. They will engage in conversations with members of the research project NEST, Christopher Pierce (Architectural Association School of Architecture), Angelika Schnell and Wolfgang Tschapeller (Academy of Fine Arts, Vienna), Johan de Walsche (University of Antwerp) and Peter Staub (University of Liechtenstein) among others. 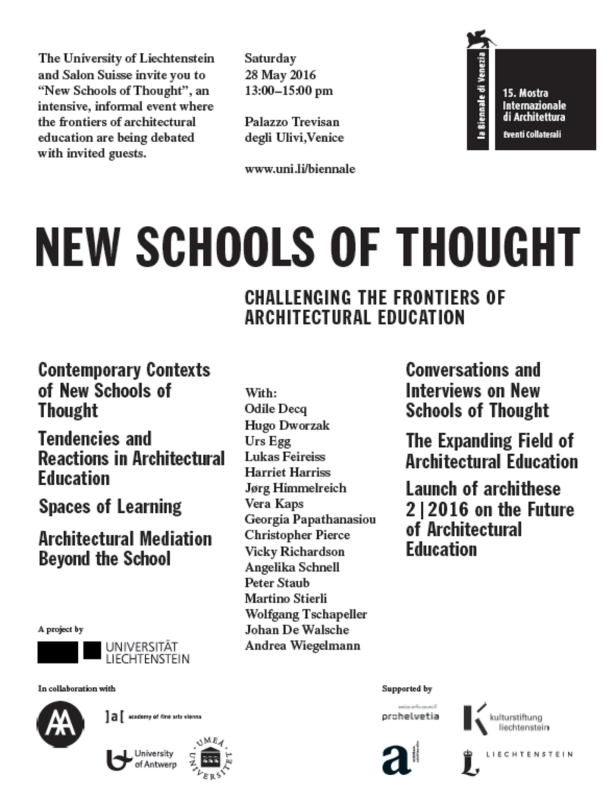 During the event a free publication, “New Schools of Thought”, containing articles, interviews and projects that explore the contemporary contexts of new schools of thought, the expanding field of architectural education as well as spaces of learning will be launched. The event, which aims to be the first one of several to be staged across Europe in the coming months, is curated by the University of Liechtenstein, organised by the Liechtenstein Ministry of Foreign Affairs, Education and Culture and sponsored by the Kulturstiftung Liechtenstein. Liechtenstein Marketing and the Swiss Arts Council Pro Helvetia act as project partners. Archithese (www.archithese.ch) is the event’s official media partner. Since the late 20th century architectural education in Europe has been reshaped by key factors such as new policy regulations, internationalisation, and digitalisation. Within these circumstances architectural institutions have been seeking ways to differentiate themselves from the masses through content, methods of knowledge creation and -transfer, and shifts in organisational structure. However, schools are no longer the only privileged place for thinking, new sites of knowledge production and reflection have arisen. The research project NEST (New Schools of Thought, www.uni.li/nest) investigates tendencies in the context of academic homogenisation within European architectural education. It defines a new school of thought as a set of ideas and new approaches on methods of knowledge creation and on forms of knowledge transfer, that a group of people dedicated to architectural design and spatial planning share about architectural education. Even though there is evidence of their emergence since the 1980s in Europe, there is a lack of understanding of the concepts that characterise these new schools of thought and the tendencies that drive them. NEST was established at the Institute of Architecture and Planning at the University of Liechtenstein and is being conducted in collaboration with the Architectural Association School of Architecture in London, the Institute for Art and Architecture of the Academy of Fine Arts Vienna, the Faculty of Design Sciences of the University of Antwerp, and Umeå University School of Architecture. Odile Decq is an internationally renowned French architect and landscape designer. Awarded with the Golden Lion of Architecture at the Venice Biennale in 1996, she has designed several buildings that have marked the contemporary architecture, as the MACRO, Contemporary Museum in Rome, or the Administration Centre of the Banque Populaire de l’Ouest in France. Also very committed in teaching architecture for the past 20 years, she launched the Confluence Institute for Innovation and Creative Strategies in Architecture, Lyon, in 2014. Lukas Feireiss attained his graduate education in Comparative Religious Studies, Philosophy and Ethnology, where he specialized in the dynamic relationship between architecture and other fields of knowledge. He is the curator and editor of numerous books and exhibitions and teaches at various universities worldwide. He is the editor of the newly established “Aedes Network Campus Berlin Magazin”, its first edition addressing "Architecture Education - Trial and Error". Harriet Harriss is a Senior Tutor in Interior Design and Architecture at the Royal College of Art in London. Harriet's teaching, research and writing are largely focussed upon pioneering new pedagogic models for design education, particularly those that respond to specific community challenges: as captured in her most recent publications, Architecture Live Projects: Pedagogy into Practice (Routledge, 2014); and Radical Pedagogies: Architecture & the British Tradition (RIBA Publishing, 2015). Vicky Richardson is the former Director of Architecture, Design and Fashion at the British Council, UK's international organisation for educational opportunities and cultural relations. She is also responsible for commissioning the British Pavilion for the Venice Architecture Biennale. Vicky was Deputy Editor at the RIBA Journal before becoming Editor of leading design magazine Blueprint, from 2004 to 2010. In 2014 she was nominated as one of Debrett’s 500, as one of 20 most influential people in British architecture. Martino Stierli is The Philip Johnson Chief Curator of Architecture and Design at The Museum of Modern Art, New York. Martino oversees the wide-ranging programme of special exhibitions, installations, and acquisitions of the Department of Architecture and Design. As the Swiss National Science Foundation Professor at the University of Zurich’s Institute of Art History, Martino focused his research on architecture and media. He has written extensively on contemporary architectural practice and his scholarship has been recognized with a number of prizes. In 2012, Martino was a fellow at the Getty Research Institute in Los Angeles. The second floor of the Palazzo Trevisan degli Ulivi at Zattere belongs to the Swiss Confederation and houses the offices of the Swiss Consulate. “New Schools of Thought” is held in the main room of the Palazzo as of 2012. Palazzo Trevisan degli Ulivi, Dorsoduro 810, is close to Campo S. Agnese. The nearest vaporetto stop is Zattere.